It would be simple to say that when you purchase a survival knife, especially an expensive one, what you’re paying for is the best knife steel, or the quality steel of the blade. The thing is, the type of steel in a knife is (or should be) chosen by the manufacturer based on the context of what the knife will be used for and on the design of the blade. The most expensive survival knife isn’t necessarily equipped with the best knife steel for every environment. 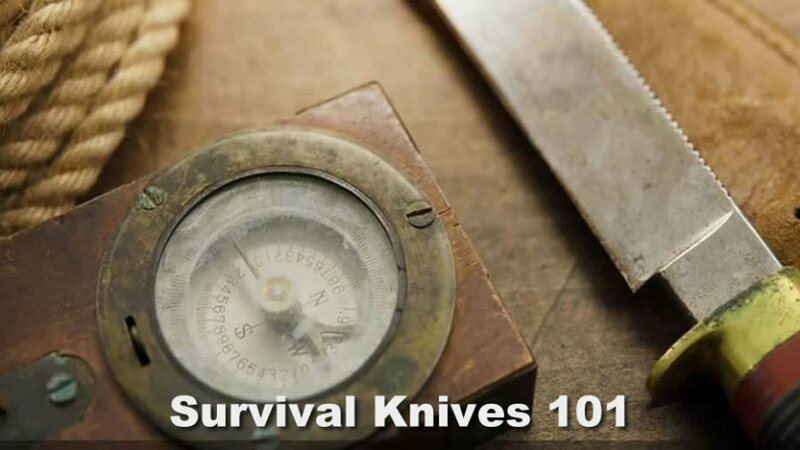 All of the characteristics mentioned in Survival Knives 101: Characteristics of a Survival Knife Blade – strength, toughness, hardness, edge, wear resistance and corrosion resistance – apply to the selection of blade metal. A survival knife must do many jobs and take abuse, which almost by definition means balancing the blade characteristics. People who make knives, both private and commercial, tend to focus on the steel of the blade and present their knife as having the best knife steel. Most of them do not smelt their own steel (melting iron, carbon, and a possible variety of alloy metals such as chromium, vanadium, nickel, tungsten, manganese and molybdenum). Knife manufacturers buy various steel alloys in plates, sheets or blanks and apply their own designs. Many “heat treat” the metal with their own, sometimes proprietary, processes. Steel makers have been developing different kinds of steel for centuries in hopes of coming up with the best knife steel. These days it’s a highly scientific business following precise recipes to produce alloys with specific properties. These ‘recipes’ or manufacturing specifications are cataloged (where they are not secret or proprietary) and have designations such as CPM-154, S30V and 154CM. There are literally dozens of these designations, and unless you’re interested in the metallurgy involved, it’s not helpful to recognize more than a few. The big divide in blade steel, and one that calls for an informed choice, is between carbon steel and stainless steel. This is a controversial subject, especially for survival knives because the properties of each kind of steel affect performance in the field. Your intended use will most like determine which is the best knife steel for you to use. Carbon steel – as the name implies this is steel with additional carbon, more carbon than is usual in run-of-the-mill steel. Carbon steel may contain other alloy metals, but it is the carbon, between 0.5% and 1.5% of the total material, which determines the important characteristics. Carbon steels can be tempered differentially (different hardness at the spine that at the edge), which is to say that heat treatment makes a very big difference in the characteristics and quality of the steel. Many experts prefer carbon steel as the best knife steel for survival knives because of their ability to easily take and hold an edge. They also count on conscientious maintenance of the blade, as carbon steel is more prone to rust and corrosion than stainless steel. In short, if a carbon steel knife is regularly honed and oiled, it’s hard to beat, otherwise…. A couple of points in favor of carbon steel, unlike stainless, when struck with flint, chert or quartz it will make fire-starting sparks. Of course, using a firesteel almost any knife steel will work. Finally, the best knife steel made of carbon is less expensive than the best stainless steel. Carbon steel types often recommended for survival knives: 5160, 1095 and CPM-3V, A2, O1, Carbon V, and CPM 154. For just plain old carbon steel with a long tradition: 1095. Stainless steel – unlike the name implies, can stain or corrode, but much more slowly. In general, stainless steel doesn’t require much cleaning. Stainless steel contains chromium, usually 12.5% to 13.5%. Modern stainless steels, often with complex alloys, have most of the characteristics of the best carbon steel with the arguable exception of ease of sharpening in the field. They are also quite expensive relative to similar quality in carbon steel. In corrosive environments, such as the sea, stainless may be the best knife steel to choose. Arguments about which is the best knife steel (carbon versus stainless) and even about specific steel types are endemic among knife people. It’s a big subject with lots of variation in design, execution and results among manufacturers. In fact, since selection of the steel type is only part of what makes a knife blade (heat treatment being the other part), what knife manufacturers do with the steel is often proprietary or poorly understood. This is a perfect environment for differences of opinion. Only field experience and years of reputation will separate the best knife steel from the rest. On the other hand, when you look at knives in a store, in a catalog or online – and you don’t see a description of the blade metal – then you know it’s probably not a serious survival knife. How so? Lack of reference to the steel shows the manufacturer (or seller) isn’t interested in proving their metal, so to speak. When many knife manufacturers buy steel for their knives, it is ‘untreated.’ This means without heat treatment, a process that can have a decisive effect on the molecular structure and therefore the characteristics of the steel, especially hardness, toughness, strength, durability and wear resistance. Heat treatment or “treating” may have several steps. Pre-heating: The steel is heated first, to 1400-1500 degrees Fahrenheit for about 30 minutes, and second to 1850-1950 degrees Fahrenheit for 30 to 60 minutes. Quenching or rapid cooling: This ranges from air temperature cooling for stainless steel to recent cryogenic (super-cold) techniques. This step is what actually creates the main characteristics by hardening the carbide crystals in the steel. Tempering: After quenching, the steel is again heated to a “tempering temperature,” which varies greatly between types of steel. This is about 400 degrees Fahrenheit for most carbon steels to 950 degrees Fahrenheit for premium stainless steels. This temperature is held for 30 to 60 minutes. Tempering is often done twice. These are the main steps. Some manufacturers insert other procedures, for example, differential hardening, or differential tempering. These are techniques where the blade edge receives one level of hardening (usually more) and the spine another (usually less hardening). As a rule, manufacturers don’t even try to explain their treatments, it’s usually far too complicated and the results may be too subtle for marketing. What it does add up to is the manufacturer’s reputation for quality. Properly treated steel will perform better in the field and eventually the word will get out. That’s why reputable manufacturers go to great lengths to protect their quality, often through warranties and impeccable customer service. It’s also what you pay (extra) for. The look of the blade metal is arguably one of the least important features of a survival knife. An ugly finish on a carbon steel knife is almost a badge of honor. For those who are persnickety about finish and appearance, stainless steel knives are likely to be the most satisfying. Coatings are applied to the blades of some knives, especially if they are carbon steel (that is, not stainless steel), because of the susceptibility to rust. The coating may be simple blade oil or it could be a special silicon or polymer coating. No coating is permanent.